Connect with phone by bluetooth,It Enable To Make Call Or Receive Call/Send/Get Message Etc Via Bluetooth. 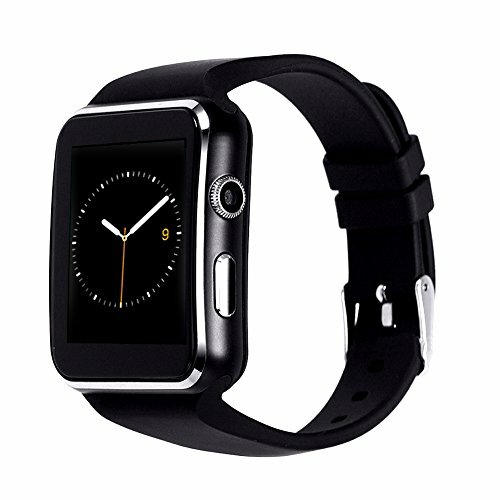 (need Insert SIM TF Card),It Enable To Make Call And Send Or Get Message Via The SIM Card You Inserted,the watch be a cell phone. Work with Andriod smartphone& Android Tablet PC. (4.2 and Above) Include SAMSUNG galaxy s4/s5/s6/s7 Edge Note 3/4/5 HTC NEXUS SONY LG HUAWEI XIAOMI ect. [ Support SIM Crad & Bluetooth Working Mode ] Networking Moder:Install a GSM 2G/2.5G Network SIM Card into the smart watch,can make/answer calls,send/reply messages directly.Bluetooth Mode:Bluetooth connected the smart watch and your phone,cam make call or receive call/send/get message etc via bluetooth. [ Touch Screen & Long Standby ] Made of highly sensitive1.54 inch HD touch screen,easy to operate;Built in 550mAh polymer battery,charger time about 1 hour,could support 3-hour phone call,6-hour music play,stand by one week. [ Easy to Set up ] Connect the smart watch with your phone via Bluetooth, then download and install the app by scan the QR Code. [ Multi function ] Pedometer, sleep monitoring, sedentary remind,Image viewer, Sound recorder (need put and SD card ), Remote capture, Alarm clock, Calendar,Camera (0.3M),Two way Anti-lost. [ Super Compatibility ] Support most Andriod smartphone,Such as Samsung Galaxy S9, S9 Plus, S8, S8 Plus, S7, S7 Edge, S6, S6 Edge, S5, Samsung Note 8, 5, 4, Google Pixel/Pixel XL, HTC, Sony, LG, HUAWEI, ZTE etc. smart phones. If you have any questions about this product by ASOON, contact us by completing and submitting the form below. If you are looking for a specif part number, please include it with your message.